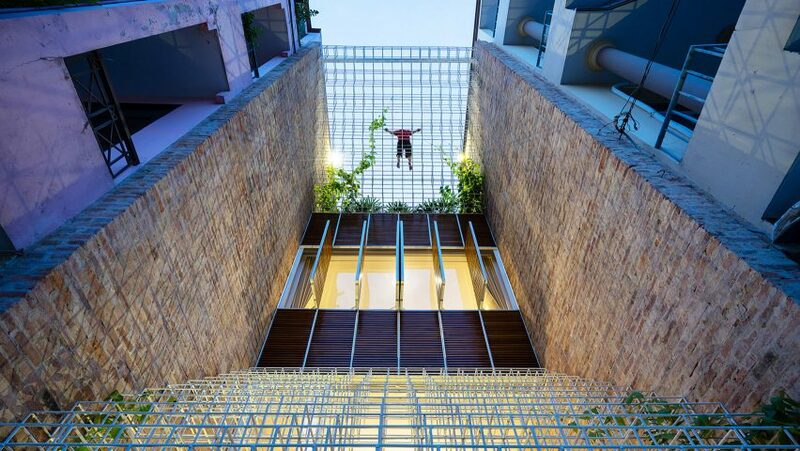 Cubes made from white-painted reinforcing rods form frameworks that support staircases and climbing plants at this renovated house in Ho Chi Minh City. Lee & Tee House was designed by local studio Block Architects for a young couple who run a business producing handcrafted leather products in the Tan Binh District in the Vietnamese city. The owners wanted to renovate an existing property on a street lined with multi-storey terraced buildings to create a new home and workspace. 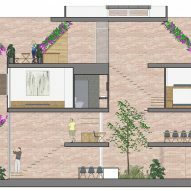 The narrow plan of the existing property informed the internal arrangement of spaces, which extend between a courtyard garden at the front and a small atrium to the rear. Original features and materials including the exposed brick walls were retained, with new additions including the painted steel frames introduced to provide a consistent element throughout. "The house appears as if it were 'sewed' with thin, white, pure thread," said the studio, which has previously completed a guest house and kitchen in the city featuring colourful painted window shutters. "Unnecessary walls and floors were removed to make space, exposing a large structure which was 'sewed' on walls alongside big frames at the front and the back of the house," it added. The frames are made from welded steel bars more typically used for reinforcing structures when pouring concrete. Painted white and arranged in a geometric pattern, the bars form a visually lightweight and permeable structure. "Although seemingly slender, they are strong and efficiently protective toward the house, while still letting air and light go inside," said the studio. Other architects have also found alternative uses for steel rebar. Canadian studio DesignAgency used it to create a shelving system within a kitchen appliance showroom in Toronto, while Penda installed modular units containing plants, lights and storage in a Beijing cafe. The street-facing elevation of Lee & Tee House features a slatted wooden screen containing the entrance. Above the screen, a stepped framework supports creepers that will eventually provide privacy and shade to the garden courtyard below. A further framework extends upwards from the timber-fronted surface of the first floor, which incorporates screens that pivot outwards to open this interior space up to the elements. An existing concrete staircase was removed to create a more open space at the centre of the building. A new stair made from steel bar and timber treads now provides a lighter and less visually dense circulation solution. Natural light from skylights above the stairwell filters through the stairs to reach the ground floor spaces. Greenery features prominently throughout the interior, where a back wall lined with potted plants is visible from spaces on each level. On the ground floor, a curved planter contains a tree that reaches up into the stairwell. The studio suggested that the use of plants "produces movement contrasting with the stillness of the brick walls." The open-plan ground floor also contains a lounge space near the entrance and a wavy kitchen counter that extends to form a dining table. A mezzanine overlooking the stairwell void accommodates a reading area and a dining room. Two bedrooms including a master suite looking onto the street are situated on the first floor. 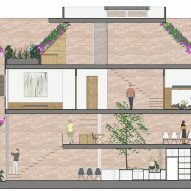 The top floor contains a glass-walled craft room that opens onto a roof terrace accommodating a picnic table surrounded by plants.